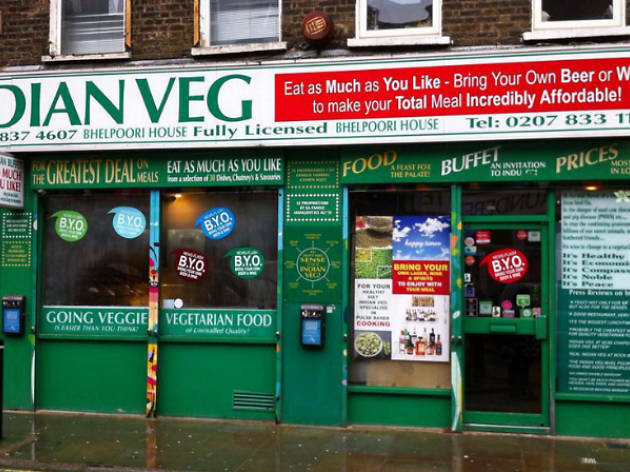 There's certainly a bargain to be had at this vegetarian restaurant on Chapel Market - its popular all-you-can-eat buffet is yours for £6.50. The décor at this longstanding all-you-can-eat Indian restaurant is worth the visit alone – the walls are covered with articles, posters, slogans and questionable karmic concepts, all geared toward the promotion of vegetarianism. Some of it is spurious: ‘Carnivorism causes war! Vegetarianism creates peace!’ And lots of it is old (we spotted a ‘Daily Express’ front page with a 5p price tag). The less said about a poem in the gents’ telling you not to be sad if your son dies, the better. Still, being surrounded by all this vaguely militant mumbo jumbo is a very low price to pay for one of London’s most interesting dining experiences. The food – a collection of vegetable curries, colourful salads, onion bhajis and paratha so light they could do with a tether – is good, and a bargain at £6.50 for as much as you can manage. And so what if a layer of oil on a couple of the curries (not to mention the delicious deep-fried crisp of those bhajis) makes a mockery of Indian Veg’s cathartic credentials? You’re still getting some serious bang for your buck. It’s little wonder, then, that it’s such a popular haunt for students and local yoof filling up before a night out on the Islington tiles – especially as it’s BYOB, too. But if you’re not drinking? There are cans of Coca Cola, stacked high by the door heading downstairs to the kitchen. Health trips and right-on ethics have to end somewhere, right? Meal for two with soft drinks and service: around £15. 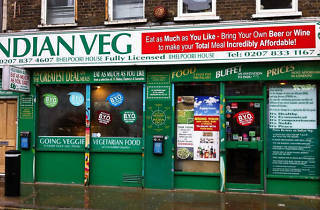 You'd be forgiven for thinking this little place at the end of Chapel Market was purely an ethical statement billboard! Inside however, you can find their all-you-can-eat buffet of non-nonsense vegetarian Indian food – with crispy onion bhajis to start, a variety of curries and daals, a delicious fresh stack of hot puris, and an awesome range of interesting salads (i.e white cabbage and mango!) I visited on a Friday evening, and it was surprisingly busy, with people literally just relaxing and hanging out. It's refreshing to find an Indian restaurant in Central London, that 1. Doesn't take itself too seriously, 2. Just serves basic home-style Indian cooking, and 3. Teaches you about the 15 amazing benefits of turmeric at the same time! If that's not enough, its also BYOB, and no one is judging you as you pull two G&T cans out of your bag! The buffet is now £7.50 but still very much worth it! Ok, ok, I know giving 4 stars to this tiny, slightly dodgy all-you-can-eat restaurant has not the same meaning than reviewing Ottolenghi's, but I must say that I love it as such! This is an authentic, VERY unpretentious, extremely cheap and deliciously spicy indian eatery. The buffet table is all the time slightly "dribbled" and the staff are grumpy and serious, all true. Although, many choices of mains and sides are constantly refilled on the trays and you can load your plate with curried dal and vegetables, paneer, brown or with rice, fried vegetables and a few different salads. All vegetarian, when not vegan. I popped in today for lunch and it was relatively quiet. I loaded up my plate with the sides (various veggies such as red cabbage) and the mains such as dal, etc and various sauces. There is also brown rice and pilau. I was pleased by the options available (and there are assorted drinks and desserts as well if you fancy) as well as the obvious cheap price -£7.95 for all you can eat. The food's flavour wasn't overly spicy, just a perfect punch that made everything tasty. The sides are pretty bland so focus on the mains. I am drinking a star because the owner/person at the till was pretty grouchy. I asked him what some of the sides were as there were no identification on them and that request seemed to annoy him. He also just grumbled a thank you when I paid. Seriously, if you don't want my money I'll gladly go elsewhere!